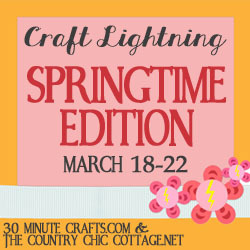 It is time for another craft lightning event. The spring edition runs all next week. Stay tuned as each day I will post a craft that takes 15 minutes or less to complete (excluding dry time). Plus each day I will post a few quick crafts from other bloggers. Want your craft to be featured? Link up ANY quick crafts in the linky party below. They must take 15 minutes or less to complete. Then come back here each day next week to see if YOU get featured. It is that easy!Head over and see all of the features from day 1, day 2, and day 3. So link up your 15 minute or less crafts below! Remember you can exclude dry time. Yay! These are my kinda crafts for sure! Can’t wait to read the whole series! Gotta love 15-minute crafts. Thanks, Angie. My favorite – things that take no time to do!! Thanks for hosting! I’m a huge fan of fast projects. Thanks for hosting this party AND for the challenge to come up with something in 15 minutes! I really enjoyed the challenge, and am still enjoying everyone’s projects!